ShopRite: Gift Card Deal – $10.00 Moneymaker Starting 11/11! Starting 11/11, Shoprite will offer a great Gift Card deal! What makes this deal so great is, they serve multiple purposes. 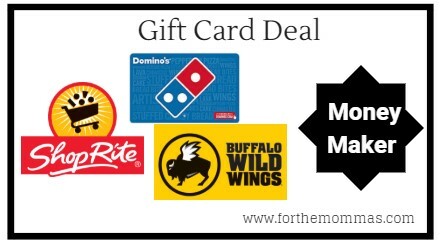 These gift card deals are always a good way to get an easy moneymaker. When you purchase $50.00 of Domino’s or Buffalo Wild Wings Gift Card you’ll get a $10.00 OYNO catalina coupon. This is a good way to score $10.00 in FREE groceries.